These are common things heard during the tax season. Why is it that some people get a big refund while others end up owing money? One of the biggest income tax myths is that refunds are a result of your tax preparer. Credit may be taken by some tax preparers who advise in tax planning and understand the tax code. 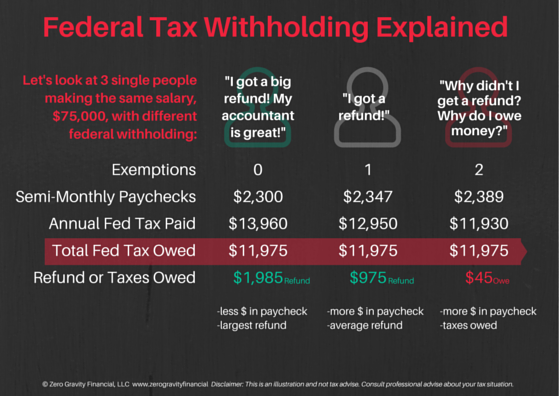 However, tax refunds are mainly due to one core concept that people do not understand and get wrong when filling out W-4 payroll forms: Federal Withholding Elections. Here is an illustration of 3 single employees who make $75,000 in 2015. Each employee selects different federal withholding- 0, 1, and 2. When they file their income taxes in 2016, all of them owe the same federal tax: $11,975. What is different? Employee #1 elected 0 Federal exemptions and received less money in his semi-monthly paycheck of $2,300 because more money was being withheld for Federal taxes. When Employee #1 files their income taxes in 2016, they will get a larger refund of $1,985. Employee #2 elected 1 Federal exemption and received more money in their semi-monthly paychecks of #2,347 and will get a smaller refund of $975. Let’s take a look at Employee #3 who had 2 Federal exemptions. They were receiving more money in their paychecks, $2,389 because less money was being withheld for Federal Taxes. When they file their taxes next year, they will owe $45 in taxes. This is important enough to repeat again: They all owe the same in Federal Taxes- $11,975. What is the best Federal Withholding election? It depends on what your preference is. If you elect 0 exemptions, then you will have a smaller paycheck and will learn to live and save within your means. Then, when you have a larger refund the following year, you will be able to allocate some of that money towards your saving and retirement goals. On the other hand, some people prefer to elect 2 exemptions because they want larger paychecks to save and invest the money now. They also understand and are prepared to pay taxes owed the next year. Understanding this concept will prevent tax surprises and help you understand that there is a mathematical reason for a large tax refund.